This month the theme for my Bostik Bloggers craft box was 'Flowers' and so with Spring on the horizon I made a little pot of colourful foam flowers to brighten up my windowill! Decorate the outside of the flower pot using ribbon and cardboard flower cut outs, or any other embellishments that you have to hand. I used Bostik Glu Dots to adhere them firmly to the pot. They worked especially well for sticking down the ribbon as it can be difficult to stick ribbon with glue, the Glu Dots hold fabric items in place really well. Gather together your wire and foam flower cut outs. Cut the wire to a suitable length, depending on the size of your pot and the height that you want your flowers to be. Assemble the flowers using foam flower cut outs. 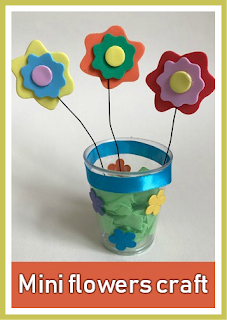 If you don't have any ready made flower shapes then you can easily make your own using craft foam or coloured cardbaord. The pieces are again held together with Glu Dots, great for crafting with children as they hold everything together really firmly. Then attach the wire to the flowers. I found that a good way to do this was to insert the wire in between two of the foam shapes. This way it is held firmly by the Glu Dot in between. You could also use tape to attach the wire to the back of the flower. Line the flower pot with a small piece of green tissue paper, then place a large blob of Blu Tack into the pot. If you don't have Blu Tack you could use florist foam, scrunched up tin foil or old play dough. Lining the cup with green tissue paper just stops it from being visible from the outside, if your pot is not see through then you don't need to use it. Push the wire flowers firmly down into the Blu Tack and arrange them neatly. Then add some more crumpled up green tissue paper to cover the base of the flower pot. You can bend the stems of the flowers to make some stand out more and to create a symmetrical arrangement. A lovely Spring display!